The Master Calendar is an elegant watch that displays the date on the edge of its dial via a date hand. Jaeger-LeCoultre utilized meteorite stone in some versions, giving each watch a unique and out-of-this-world touch. The Master Calendar from Jaeger-LeCoultre tells you just about everything you need to know regarding the time: the current time, date, day of the week, month, and in some versions, even the current moon phase. It's a stylishly designed watch that goes well with a suit and tie. One particularly eye-catching Master Calendar feature is a hand that looks like a seconds hand, but doesn't move like one. Instead, the hand moves very, very slowly. 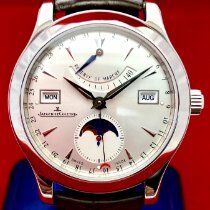 It ends in a sleek, red half-moon that points to a number ranging from 1 to 31, which represents the date, on the edge of the dial. This is the so-called date hand. The Master Calendar's seconds hand is located on a subdial at six o'clock, which on most models also hosts the moon phase indicator. However, a rare version without a moon phase indicator does exist; on it, the subdial is solely for seconds. Which Master Calendar should I buy? Are you looking for an elegant Swiss watch with that special something? The Master Calendar is a conservative dress watch that offers a few extras upon closer inspection. The meteorite watches are understandably more expensive than the standard model, seeing as the dial material is limited. After all, only around five meteorite falls are observed every year. The rare stone makes every watch a unique piece. Jaeger-LeCoultre also offers a pink gold version of the meteorite watch. Its dial is dark gray and features a unique pattern: the inner structure of the meteorite. This Master Calendar (reference number Q1552540) is available for around 17,000 euros, making it the most expensive version of this timepiece. If you like pink gold cases, but could do without a meteorite dial, then the version with a simple silver dial (Q1552520) is a good choice. It's also somewhat less expensive, costing around 15,000 euros. 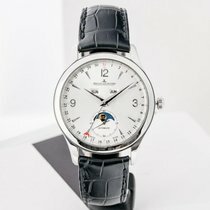 If the stainless steel model with a light gray meteorite dial (Q1558421) has caught your eye, then you should be prepared to spend around 8,000 euros. 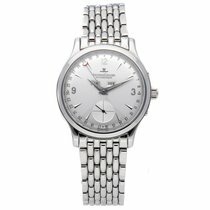 For a bit less, you can purchase a new stainless steel model with a silver dial and moon phase indicator (Q1558420) for 6,500 euros. The 39-mm case diameter ensures that the watch looks great on most men's wrists – not too big, but not too small. The Master Calendar most often has a silver dial, though some versions feature a black dial. Other variants have a dial with an irregular light or dark gray hatch pattern made of an incredibly interesting material: They're made of a stone that originated in space. Jaeger-LeCoultre sourced the material from a meteorite that fell in Sweden. It's cut into thin pieces to produce two different dials for the Master Calendar models. The Swiss manufacturer first introduced these watches at the end of 2014 as a part of their 2015 collection. The standard Master Calendar was initially introduced in 2013. 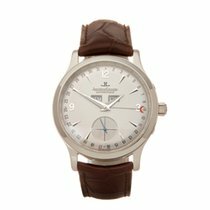 Its predecessor, a different calendar watch, had been produced since 1945; JLC watches with a date hand have been around since the 1930s. The Master Calendar is 10.6 mm thick, an acceptable size for an automatic watch with complications. If you prefer a thinner watch, then the 7.4 mm Ultra Thin may be a good fit. As an added bonus, the Master Calendar is waterproof to 50 m (5 bar) so you can wear it while swimming. The automatic Jaeger-LeCoultre 866 movement powers the Master Calendar. As is the norm for Jaeger-LeCoultre calibers, it's an in-house caliber. It's comprised of 305 components, 32 jewel bearings, and vibrates at a frequency of 28,800 alternations an hour; the power reserve lasts 40 hours. Thanks to the see-through glass case back, you can watch the in-house movement at work. The day of the week display is located on the left side of the dial underneath 12 o'clock with the month window to the right of it. Both main hands are tapered dauphine hands, a classic look that has been beloved since the 1950s. A comparable watch from another renowned Swiss manufacturer is the Rolex Cellini (50535) with a moon phase indicator and date hand. If you prefer a German-made watch, Glashütte Original offers the Senator Hand Date with a date subdial at three o'clock.